We traveled north; a 300 mile trip for me, to Darlington on the Friday morning. The Croft circuit is pretty basic in terms of facilities. Portaloos, a stand-pipe and burger van. What more could you need? Arriving at lunchtime we grabbed a section of tarmac as our base, next to the TF Motorsport truck, who'd transported the car ahead for us. Not having an awning meant we'd work out of the boot of the Freelander and expect to get wet over the weekend. We had to get a new left front tyre fitted in anticipation of wet weather, the others are half worn (3.5mm tread) and will do for a while yet. Heading out for the first of two 30min practice sessions, the track is flat and fast with some 4th gear 100mph corners. I managed several 5 lap stints, reducing tyre pressures as the temperatures increased. I finished the day setting times a couple of seconds down on the front runners and pretty happy with how I ran given the limited time to learn the track and make setup changes to suit conditions. A bonus in the evening was a Mexican food and drink night put on by some of the driver's families which went down really well with everyone. 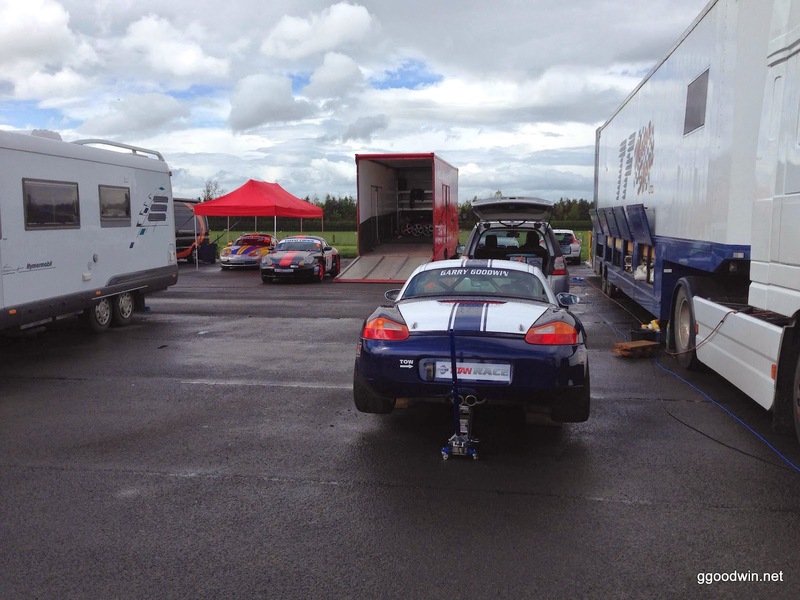 We awoke to torrential race on Saturday morning, so arriving at the circuit we hastily changed the roll-bar and damper settings back for wet conditions. Qualifying was very difficult with standing water in many corners and all the way down the start finish straight. I qualified 13th as the slowest Boxster, 2 seconds off the next best. Afterwards we found that in my haste I'd set the dampers wrong and the settings were all over the place. This married with the fact almost everyone else has a spare set of wheels with new tyres gave me some solace. The first race is before lunch. We guessed the track would be partially dry, but on the green flag lap it's fully dry. On the grid I somehow missed the lights and got passed by all 3 production spec Boxsters down to turn 1. I'm thinking I'll pick them off one by one, but coming into the last section of the lap mud got sprayed up across my windscreen. In my efforts to get the wipers to clear it I managed over rev out of the hairpin, put two wheels on the wet grass and a 180 spin was inevitable. Luckily following cars avoided me and and I got the car onto the grass out of thier way. On rejoining I was dead last so spent the race picking off the slower Porsche 924's. The weather was again changeable, but I went with a full dry setup, determined to make the best of it. I got a much better start gaining a position and keeping up with the battle for 7th place ahead and making it a four way fight down to 10th. With stiffer suspension settings I found I could push harder through the faster corners to keep up and trail-brake into the slower ones to gain on the cars in front. I felt confident of attacking for position towards the end of the race. Unfortunately a car went off into the barriers and the safety car was inadvertently put out onto track and we all followed it round for the last 5 laps. I finished 9th, much happier that I could run with the mid pack of cars.